Did your mom bake pies when you were little? My mom baked cupcakes and cakes and cookies but never pies. Perhaps that’s why the very thought of making a pie crust from scratch is intimidating and a mystery to me. When Briana Carson invited the Atlanta Food & Lifestyle Bloggers’ Society (I’m a member and current president) to a special, members only pie baking and pie tasting event at her shop, Crave Pie Studio I was so in! 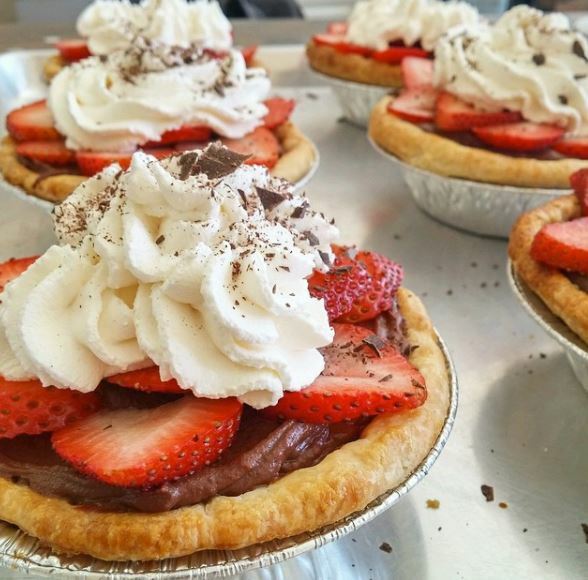 This is a sponsored post in partnership with Crave Pie Studio. The pie baking class and pie tasting samples were complementary, however all opinions are those of the author. 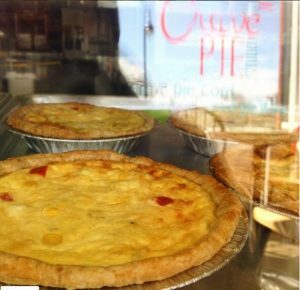 Walking into the Crave Pie Studio is a little like turning the clock back and stepping into a kinder, gentler time when being nice was important. My initial reaction would soon be validated by Briana’s warm hospitality and her joy in making us feel at home. In fact, the concepts are purposely integrated into the company culture. Before the pie making class began we were treated to our choice of a savory pie to snack on. I was delighted to see there was chicken pot pie on the menu. 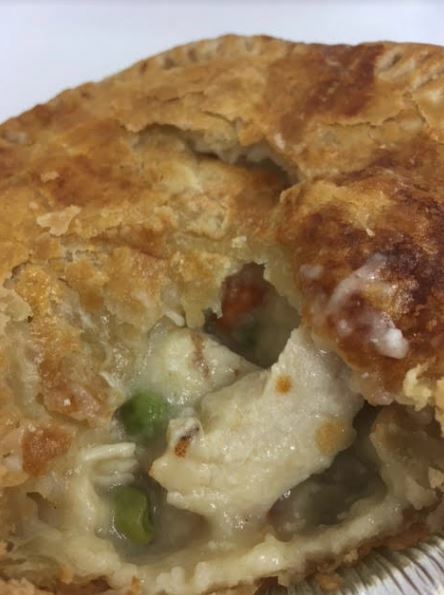 Let me tell you, I am still dreaming of that divalicious chicken pot pie! We put on our aprons (my chef’s apron was a gift from my friend Chef M), washed our hands and settled into learning about how to make pies. Briana even told us about different rolling pins and an easy way to cut butter and apples for our pies. As we were rolling our pie dough Briana casually mentioned that if her pie bakers were upset or in a bad mood they were not allowed to make the ever important pie crust. As Briana explained if you’re not at your best it’s easy to unintentionally take it out on the dough resulting in a crust that is not as flaky or delicious. Briana was the perfect teacher – demonstrating each step and patiently assuring us that all we did was wonderful. If you’ve ever cooked with friends you know what usually happens… sharing stories, laughter and lots of smiles. That’s exactly what Rochelle / Culinary Veg Out, Cassandra /The Chef in Pearls, Briana and I /Diva Foodies experienced. It was a special baking “girl friends” time that put the event over the top for all of us. Pies take time to bake and Briana had lots of mini pies for us to taste as waited. There were pecan, bourbon pecan, chess, lemon custard, raspberry and apple crisp pies to nibble on. The lemon custard was like spring in a bite. The pecan bourbon had just the right amount of whisky. But Briana had another surprise… she poured glasses of Prosecco and we toasted to friendship and food made with love! Channeling our inner @misterbarragan @Dingraham83 – 🥧 baking and tasting(!) @CravePie . My pie baking and tasting experience was a success. 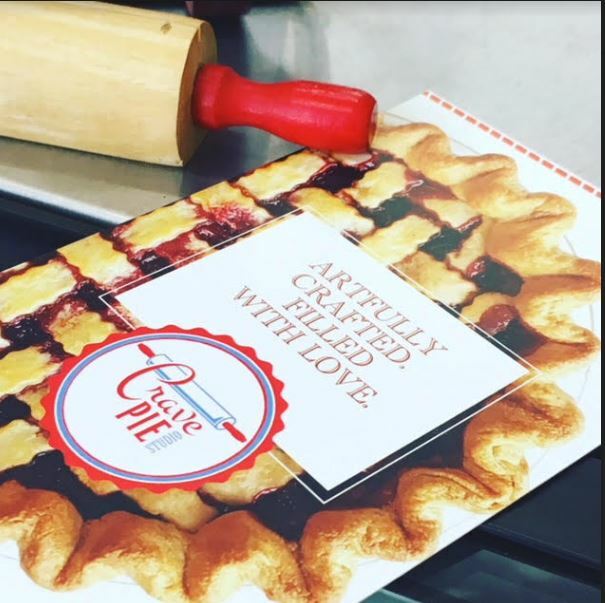 I discovered with a little patience I could make a pie crust but if I don’t have the time I know Crave Pie Studio and Briana will be waiting to help me out. PiEvangelist Briana’s story is inspirational and I wanted to tell you more of the behind the scenes of her how and why. Briana kindly agreed to share her experiences and future plans in this interview. Hope you enjoy reading – over a piece of pie! 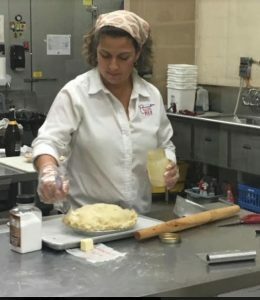 Diva Foodies: Your story as a pie baker is an inspiration especially for people who want to start “encore careers.” Let’s begin our conversation by explaining how you developed a passion for pie baking. Diva Foodies: You might have chosen to bake pies just as a hobby for lucky family and friends. People start businesses for many different motives but we’ve found that food makers often have their own special reasons. Why did you launch Crave Pie Studio? Diva Foodies: For many foodprenerurs or food makers their sales and promotional channels are often local fairs, farmer’s markets and perhaps an eCommerce website. Why did you want to take on the expense and responsibility of a retail shop? 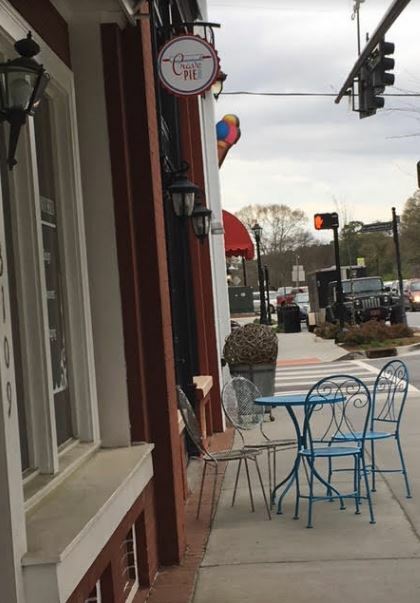 Diva Foodies: Although not a far drive, I had never been to Downtown Duluth and was charmed by the renovation and your shop which really does fit into the small town nostalgic theme. 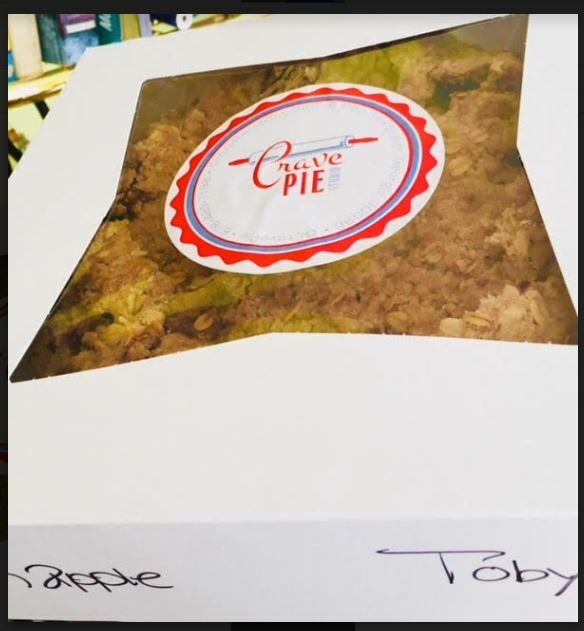 Chef Emily Ellyn would definately call Crave Pie Studio – Retro Rad! I was excited when you invited the Atlanta Food & Lifestyle Bloggers’ Society for a special pie baking (and tasting!) session. But I admit, never having made a pie before I was a little apprehensive about making my own pie crust. Would let us in on the baker’s the secrets for a flaky pie crust? 4) be fearless…it’s just pie dough! Like any skill, the more you practice, the better you will become. 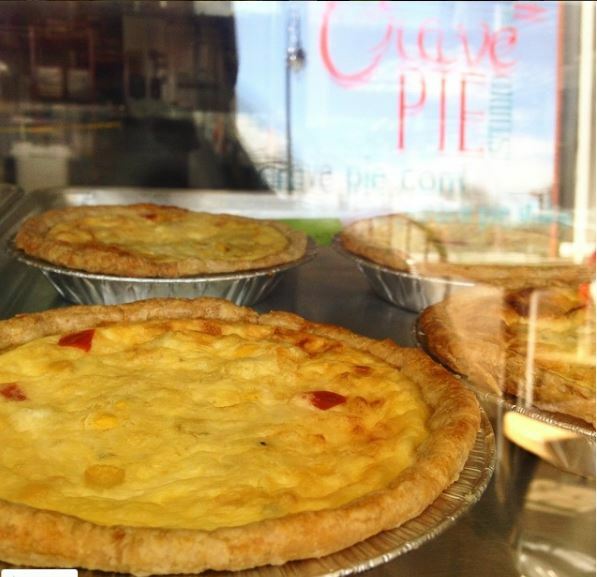 Diva Foodies: What are the most popular flavors at the Crave Pie Studio? 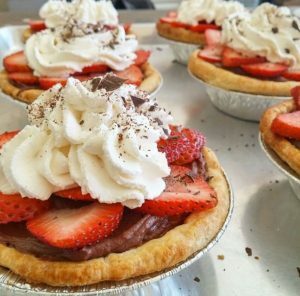 What is Your favorite pie and why? Diva Foodies: Ah – now I know why I loved the Chocolate Bourbon Pecan so much! I even ate it frozen… so good! Really. Diva Foodies: For many people food is love. What does that mean to you? Briana Carson, Crave Pie Studio: To me, preparing food for someone is literally an expression of love. From the care that goes into selecting ingredients, to the attention that is put into the preparation, there is a transfer of personal energy and feeling that goes into the food that creates a kind of intimacy with the diner. I think love is the ingredient that makes a dish memorable. Diva Foodies: As you well know, competition in the food product world is fierce. What makes your products extra, extra special? Diva Foodies: What one tip would you give to a person who wants to go down the path of being a food maker? Why is this tip important to you? Diva Foodies: As is often Diva Foodies’ tradition, I’ll toss the last bite (or word) to you. Wrap it up anyway you’d like. 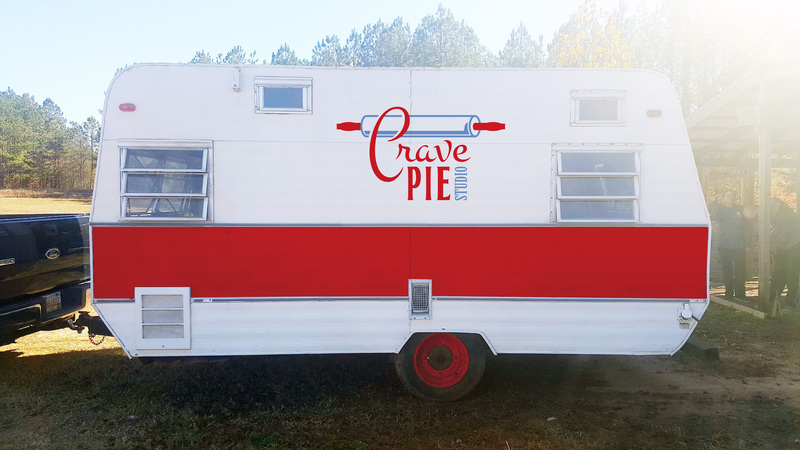 In order to serve pie to a wider audience I am excited to announce that Crave Pie Studio will soon offer pie catering for weddings, corporate events and private parties in a renovated vintage camper trailer, which I have named the HapPie Camper. 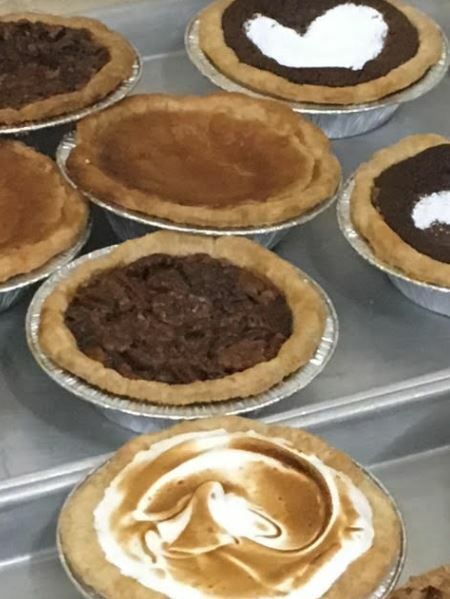 Crave Pie Studio will be serving up pies and retro vibes throughout the Metro area, later this spring. You can follow along as we make progress at @happiecamperatl or at cravepie.com.